Apologies for the lack of updates, I was away in Jakarta for a few days, then I had food poisoning…quite badly…so spent a couple of days either in bed or on the toilet. Anyway, a while back I went to The Eye on Malaysia, another waste money project sponsored by the G.
I went twice, the first time I conveniently forgot my tripod, so no decent shots..but thankfully there wasn’t fireworks that night so I didn’t miss anything. I duly went back the next weekend, and camped out an hour or so before the show, and got what I wanted! It was my first time taking fireworks, quite an experience. This 30 second exposure spent quite a long time as my wallpaper! Do view Large on Black for details! It really was a fantastic fireworks show, I was quite surprised. It was totally worth the wait! I did actually ride on the eye, not that it was really worth it, you can’t see anything that you haven’t already seen if you’ve been up the KL tower or on Petronas bridge. The crowds at the eye were pretty massive every day. As usual let me know what you think of the pics and which is your fave! Cheers. 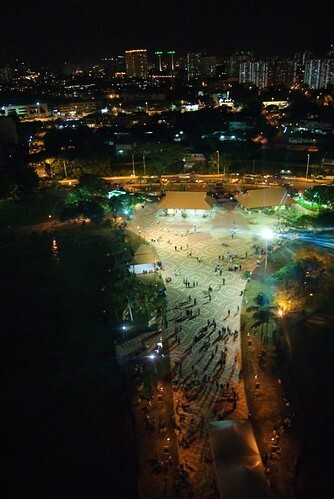 19 Responses to The Eye on Malaysia – Taman Tasik Titiwangsa – Fireworks! Without a doubt, the third picture is the most awesome! yea the third picture is good, the second one looks nice too. i kinda like how the lights from the ferris wheel and KLCC and that building(dewan bahasa & pustaka? correct me if im wrong lol) blend with the black sky and the waters. im curious though about why all the ferris wheel in the pictures look like its spinning really freaking fast, or is that because of some photography technique? im not sure :X never really got into photography. I’m no photography expert myself, but if I’m not mistaken, you can get the effect ST has here by using a slower shutter speed. lovely pics as usual. ky is mean!! Superb! Nice pictures and full of colors that cover the night. wow, good shots, i like the third pic too. Nice work. The best pix of the Eye of Malaysia I’ve seen. Wonderful pictures, the best I’ve ever seen, and the fireworks, they are like orgasms… LOL, beautiful! Azmeen: Thanks 🙂 It still rocking as my wallpaper. moonss: Thanks dude. Yah the lights and the wheel look like that because of slow shutter speed, most were between 10-30 seconds of exposure. And yah it’s Istana Budaya. suanie: Ahaha yeah a bit scary. pik: Nice shots! Sadly the fireworks were only on in January…no more. You can still get some nice shots though, I recommend going around sunset. Louis Pang: I love your wedding stuff, glad you like the pictures. zidni: I use a Nikon D200. Very nice pictures, I like the 3rd one the most. I wish I have a chance to capture all these, hehe. Wish I could be there to pay a visit next year. GhostTedd: I don’t think the eye will still be there next year, good luck tho!